In the previous articles on how to start a vegetable garden we looked at what is necessary in starting a garden in general and more specifically the first steps in starting a vegetable garden, now we are at the fun stage of planting a vegetable garden and where we decide on our vegetable garden layout, which plants to grow where, and of course, how to grow all those beautiful vegetables. Now we are at the stage of thinking about which vegetables we would like to grow. 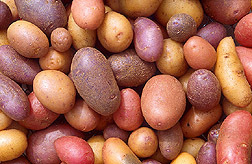 However, one of the key areas of growing vegetables is an area known as crop rotation. Basically, all this means is that you do not grow the same vegetables in the same patch of years in sucessive years. This avoids nutrient depletion, and ongoing soil and/or pest problems. 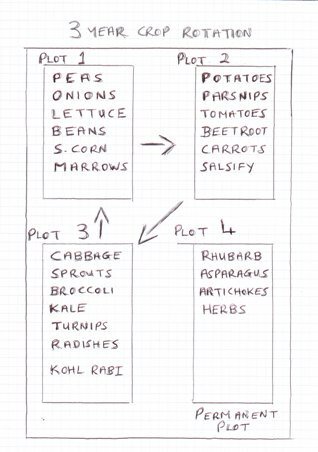 It's not complicated and I will provide some sample rotation plans and discuss how to layout your vegetable garden in the article on vegetable garden layout. It is important to do as different plants place different demands on your soil. Your soil can grow depleted and tired if the demands on each patch are not varied over the years. We have discussed the soil types before but it is worth running over again, just a little refresher. As previously mentioned , crop rotation is important. Along with that you will probably be adjusting the soil a little bit one way or another depending on what is growing where. Once you know the general condition and type of soil you are planting your vegetable garden in, you will be able to adjust accordingly. A very simple method to test your soil type is to pick up a small handful of soil. Now, wet it and remove any stones. Now, try to roll it into a worm type shape! If you cannot roll it into the worm shape it means you have a light , sandy type soil. If you can roll it but it then loses shape, you have a good soil, this type of garden soil is often referred to as "loamy". Don't try to change your entire soil type when planting a vegetable garden. 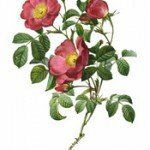 Grow plants that grow well in your particular type of soil. Of course you could change the soil type of smaller areas, but to do so on a large scale would be a huge undertaking. It is generally easier to adjust what you are growing rather than your soil, smaller bed make it a lot easier if you want to change your soil. With smaller bed you could do it one at a time. Sandy soils dry out a lot quicker than clay, so will need careful monitoring for watering. On the plus side sandy soils heat up a lot quicker than clay. 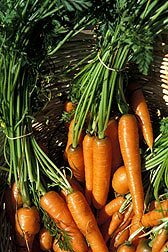 Carrots in particular like sandy soil if its nutrient value has been boosted by adding good mature compost. The compost also helps with moisture retention. Try to avoid walking on sandy soil as a layer forms on top which makes it difficult for seed to break through. Clay soils are really the reverse of sandy, so the opposite of everything stated previously about sandy, with the exception of one thing, try to avoid walking, as much as possible, on clay soils. Add good rich compost and sharp sand to make clay type soil lighter to work with and better for growing in. What you are looking for is a nutrient rich, reasonably moisture retentive, workable soil. It's now time to decide on your your crop rotation plan and vegetable garden layout. 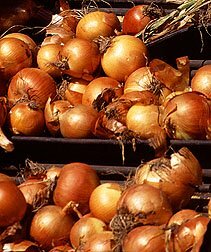 When that is decided ,come back to this page for links to all the "how to grow" articles for many, many different types of vegetables.